Jason Mastrodonato at MassLive.com has an intriguing look at Grady and how he feels about getting back into the game after a 2 year layoff. Sizemore smiles for the fans and seems in a good enough mood, but something doesn’t feel quite right. His mother, Donna, says he’s naturally shy and likes to keep to himself, so all the attention could be adding to the discomfort. But that’s not why he feels weird. 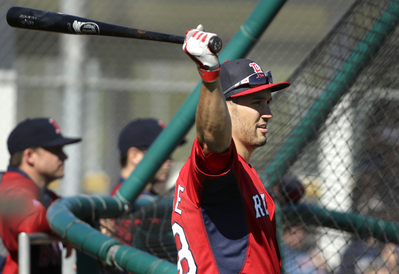 Grady Sizemore feels weird because he’s wearing a major league uniform for the first time since 2011. Check out the full piece, including insight from Grady’s mother Donna, and his high school baseball coach at MassLive.com. Welcome to SizemoreFan.com! Here you will be able to find the latest on former MLB outfielder Grady Sizemore including photos, media, and much more so make sure you check back often! Please feel free to contact us at admin[at]sizemorefan[dot]com with any questions that you may have or wish to contribute news, photos, videos, etc. DISCLAIMER This is a non-profit fansite run for the fans by fans. SizemoreFan.com is in no way, shape, or form affiliated with Grady Sizemore, the Boston Red Sox nor anyone affiliated with either party. We are also not Grady Sizemore nor do we personally know him. Please do not send fan mail to us. SizemoreFan.com is simply a fan site run by us to promote Grady and express and show our dedication as fans. All content are copyright to their respective owners. All graphics and html are © SizemoreFan. If you have any questions or concerns or feel that you should be credited in some way, please contact me. No copyright infringement is intended.